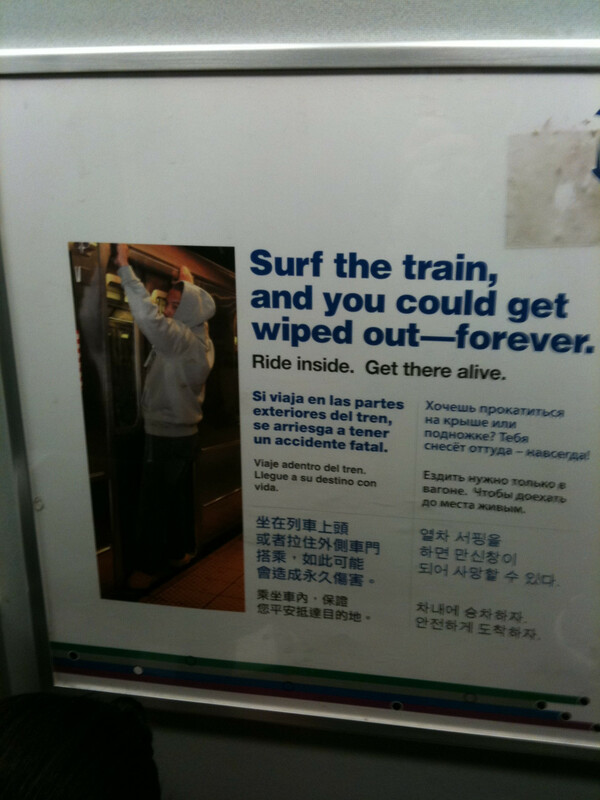 Either this is an actual PSA because “surfing the train” is an actual problem in the New York City subway, or this is the raddest prank of the year. Has anybody ever tried to surf a BART? Never heard the term, but it has its own Wikipedia page! Those ads are a couple of years old. There was a pretty high profile train surfing death in NYC awhile ago, and I think they are a reaction to that. “read inside, get there alive” nice. Uh. it’s real and has been for a while. You guys seem so naive at times. SF is the NYC of the west – even has a Union Square. Don’t blow it! They have been up for 10 years at least. Here is a pic I took back in ’01. Whoops that was actually ’04. Date on the photo is wrong.